I would lose my mind if they were able to do the TMNT from this game. Nothing shocks me, I'm a scientist. I hope they make an Injustice 2 Flash. Also, I would love it if they got the license to do 3.75 inch DC Extended Universe figures. I would love a BvS Batman and Superman and Wonder Woman from the films in this scale, especially Flash and Aquaman. Honestly I did not like that Flash. The costume looked like it was held together with bailing wire, which if you want to get technical, would not work at his speed. The TV Flash looks better. Probably gonna pass on that one. Much prefer classic Harley. I have the first series of Injustice 3 3/4" figures. They look great but are as brittle as hell. Solomon Grundy broke while I was trying to tak him out of the package. Batman's head came off while I tried to turn it, and Wonder Woman snapped in half for reasons I can't explain. Those were from DC Collectibles. These are from Hiya Toys. The spirit of DC Direct lives on in these figures then lol. DC Direct at the time was using clear plastic joints which were brittle. Even the bigger figure collectors complained about those joints. So DC Direct changed them. They haven't made any 1/18th figures with the new joints. I'm still grateful that of all the figures I have from DC Direct/Collectibles the only one that gave me any problems was Injustice Catwoman. One of her arms was broken at the elbow before I even opened the package. 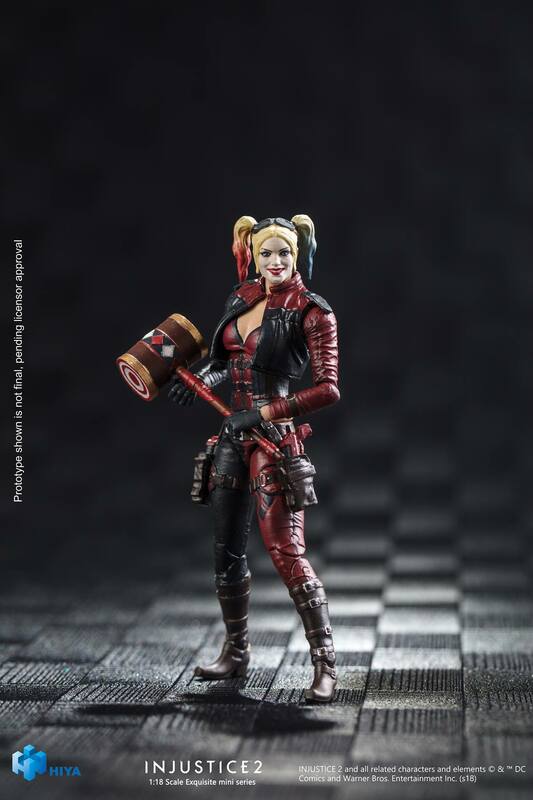 Very impressed with Harley from the promo shot. Looking forward to seeing their Supergirl and that rumored Wonder Woman, now. In the past like, 8 years or so, the Joker has gone through some really weird designs. 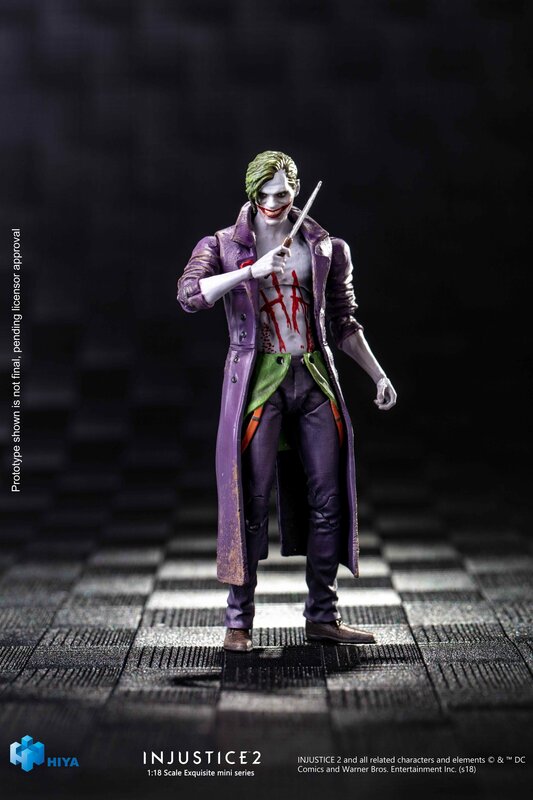 From dreadlocks, to detachable face, to hot topic anarchist, they all have a little late 90's Xtreme-vibe to them that seem very un-Joker to me. I'm sure that comes off a bit "purist" and perhaps it is, but man some of these designs are weird to me. Anyway, to keep this more on topic -- Red Hood and Swamp Thing are definitely interesting to me, but I've heard Hiya Toys have durability issues, does anyone that owns some of their stuff have breakage issues or anything? I have one of the Aliens and City Hunter Predator and the only problems I had was the Predator's shoulder being stuck (fixed it with a hairdryer though) and the Alien's tale broke but that was my fault because I thought it was on a ball joint but it wasn't. Yeah unfortunately. Injustice 2 solely takes place on an Earth where Superman is evil. I never liked this Leto style Joksr. I mean he’s the Joker. He’s beyond this “edgy” style. That flash is incredible looking! Is there any idea when these are supposed to come out? Oooh, I might end up getting Supergirl! She was my main in the game. 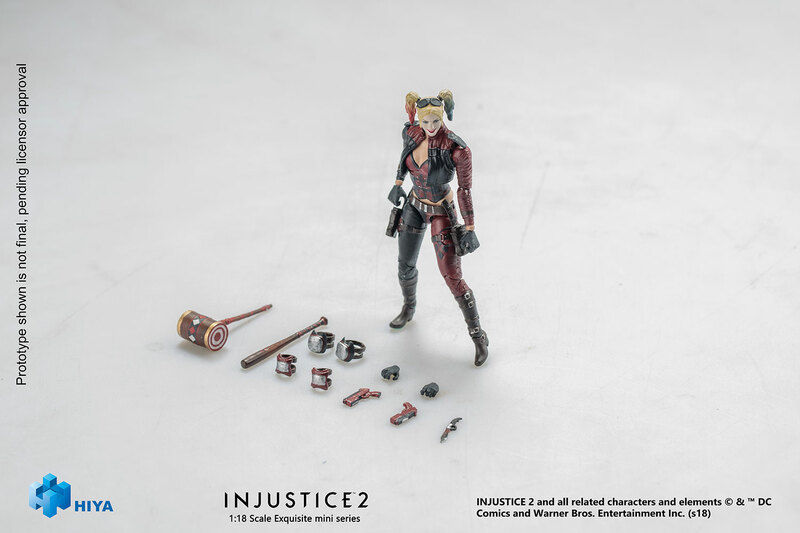 Have they already released any of their Injustice figures? Any idea on quality? Man,I'm buying all of this line.